Logo of the Army of the Guardians of the Islamic Revolution, more commonly known as the Revolutionary Guard. In the aftermath of Tunisia and Egypt’s successful protest movements, demonstrators in Iran have taken to the streets in the largest antigovernment rallies in at least a year. Unfortunately, the structure of the Iranian regime makes protests there much less likely to succeed than in the Arab world. Both Egypt’s and Tunisia’s revolutions ended when public protest against the executive led to quiet military coups– both countries are currently under the control of interim military governments. In countries with weak opposition movements, a lack of civil institutions and developed militaries, like Tunisia and Egypt, this is probably the only likely mechanism for successful antigovernment revolutions. It’s true that military governments are not ideal, and it is interesting to see American liberal commenters celebrating what is essentially a military coup, even if it’s probably benign. Encouragingly, there’s good reason to suspect that the interim military government will uphold its pledge to hold elections in the next year. 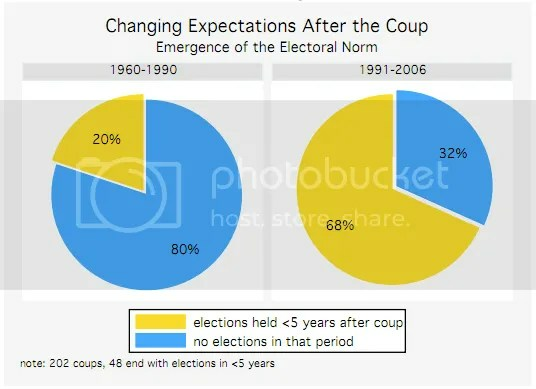 Recent research has demonstrated that in the last 20 years, in contrast to most of the 20th century, military coups have usually led to eventual democratic elections, validating the idea that the military can be a stabilizing force during an autocratic country’s transition to some form of democratic government. Source: Goemans and Marinov, 2008. However, it’s worth remembering the distinction in Egypt between the regime and the executive. Mubarak was the figurehead of the regime, which is composed of durable military institutions that have governed the country since the 1952 coup that overthrow the monarchy. Mubarak’s departure doesn’t mean the regime’s gone- through the military it’s still controlling the country. Both the Egyptian and Tunisian revolutions unseated their presidents through the action of the military. However, we can’t expect this same mechanism to work in Iran. The Iranian military, especially the Revolutionary Guard that exercises control over most aspects of Iranian public life, is ideologically allied with the executive in a way that the Egyptian and Tunisian militaries were not. The Egyptian military consented to unseat Mubarak because the Presidency was just the most visible aspect of the regime, and by extension state, that the military still controlled. For Egyptian military leaders the coup that removed Mubarak did not fundamentally threaten their position as the power behind the government, and Egyptian government will continue to change at the military’s pleasure. The dynamic in Iran is much different. Iran is not ruled by a regime composed of institutions but rather of ideology and individuals. A popular uprising demanding the ouster of President Ahmadinejad is not tolerated because the Iranian religious authority has personally linked itself to him by violently defending the illusion of the legitimacy of his election in 2009. This hardline stance was a commitment that can’t easily be backed down from. Protest against the office of the President is protest against the Supreme Leader, and by extension the military itself, making the kind of informal alliance between protesters and the military that characterized Egypt’s revolution unlikely in Iran. The internal Iranian military authority, the Revolutionary Guard and its Basij paramilitary offshoot, can’t be separated from the executive and won’t be persuaded to arbitrate even a semblance democratic change. It’s also worth noting that Iranian protesters are overwhelmingly urban youth, and aren’t representative of the entire population. Unlike in Egypt and Tunisia, where the governing regimes were despised by a large portion of the population, a significant number, perhaps a plurality, of Iranians remain loyal to the government and the ideals of the revolution. Pro-government demonstrators only emerged in Egypt after the regime began paying them- this isn’t the case in Iran, where the Basij are motivated and well organized. Military coups in response to public pressure against the executive have been the endgame in both the Egyptian and Tunisian revolutions, and both these protest movements succeeded because the military was aware of the distinction between the regime and the presidency, and was willing to sacrifice the latter to preserve their privileged social position. This distinction between the executive and the state does not exist in a meaningful way in Iran. If the mechanism of military cooperation and an eventual coup is not available there democratic protest is much less likely to succeed in Iran than in the Arab world. The driving force of the possible revolution in Iran should be the hope of its people that the cooperation with the Western world would bring much positive outcomes than the situation in which the country is right now.